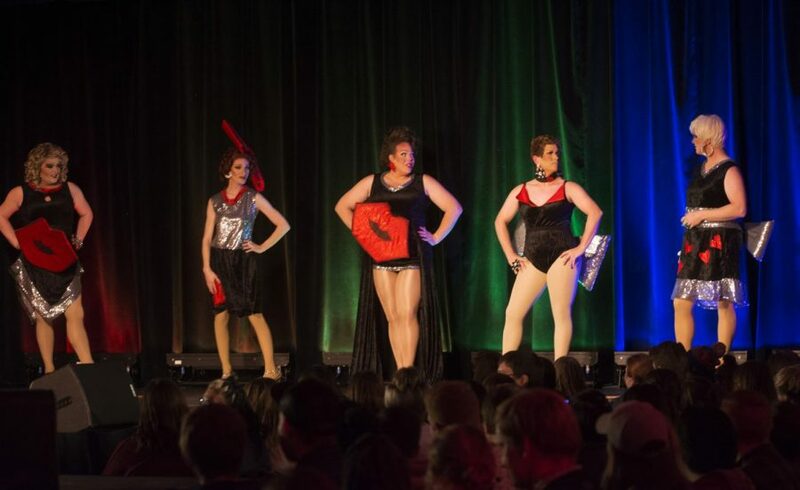 Diva’s After Dark preformed their annual drag show during the Rainbow Rave Conference. This conference takes place every fall, and the drag show is the event at the end of the conference. “As the saying goes, if a village has one doctor, then they are the village doctor. Well, our village has five drag queens, so we have to be it!” Divas After Dark’s Roxi Heart said. The Rainbow Rave Conference took place on Nov. 10. The day consisted of ally training, followed up by a series of conference sessions, and then concluded with the drag show featuring Dubuque’s Divas After Dark. The entire day was dedicated to the LGBTQ community. Ally training was hosted by Emily Steir and was open to staff, students and administration. The purpose of ally training is to provide individuals with basic LGBTQ education and concepts regarding gender and sexuality. They provided ways to be an inclusive and proactive ally. The conferences consisted of various sessions regarding topics in the LGBTQ community. Sessions included LGBTQ life in Southwest Wisconsin, which was a panel by the Alliance; Gender Identity, Expression and Experience by Elliott Parsons and Jaime Collins; Ballroom Culture by Ricardo Wynn; Drag Culture by Divas after Dark; and Queer Progress by Phillip Gordan. These sessions provided insight on a variety of LGBTQ topics. The Divas started to dress up in drag when they were in high school. They rented a home in which they hosted little shows with friends on Friday nights and charged $5 a person. The Divas After Dark had a packed audience on Saturday night. The Rainbow Rave concluded with the drag show, which was hosted by Divas After Dark’s Roxi Hart and Kyra Vitale. They have been preforming for 16 years and love it. One of the reason they love to preform is that they feel like they have a personal connection with the audience. They also make 90 percent of what they wear which includes dresses, shoes and jewelry. It takes about three hours for them to put on their makeup, and their shows usually last from two to three hours, depending on the venue.